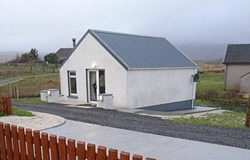 This luxury one bedroom Chalet on the Isle of South Uist is ideal for couples. There a feature fireplace with large flat screen TV built in over a multi fuel stove. The modern kitchen has all appliances & essentials. There is free Wi-Fi & Freeview for guests. The bedroom has large built in wardrobes for luggage & flat screen TV. The property sits at the foot of Ben Kenneth a 5 Minute drive from the ferry port in Lochboisdale, which has a cafe, shop & hotel. In the opposite direction we are 10 minutes away from crisp white sandy beaches & also the famous Askernish Golf Course designed by the late Tom Norris.